Naturally with this year commemorating 100 years since WWI began there has been a smattering of fringe entries based around this event. What makes this one stand out is that the story is a local one. 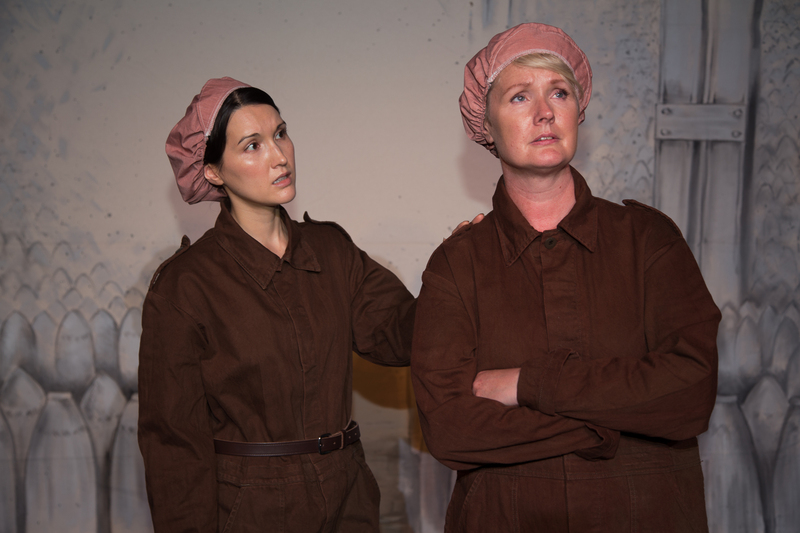 Swan Canaries tells the tale of life in a munitions factory in Nottingham during the First World War. For those of you who don’t know, in these factories the women filled the shells for the war. The performance gives us a snapshot of four women’s lives inside the factory; the young lover, the widow, the mother with a secret to hide and the teacher turned factory supervisor. It was a thoughtful production made all the more interesting and emotive with the use of songs from the era. The audience were encouraged to sing along throughout which added a “jolly” feeling from the start. Speaking of, the audience were given small tickets upon entering, offered cake for one of the girl’s birthday and when the play began we were spoken to as if we were starting work in the factory. The company made each person feel included as if we were part of the ladies exclusive group. I think that this made each person invested in the performance and the lives which were being portrayed. I was fully immersed in their tale. The production was imaginative and clever in the way it created the entire munitions factory with just their bodies and 2 stools. Their actions and the staging were simple but effective, seamlessly moving from inside the munitions factory to outside just by a difference in how they moved and where they could walk on stage. Furthermore their use of physical theatre at moments throughout the play added texture to the visual and the story they created. If all this hasn’t enticed you enough to see Swan Canaries I must mention the acting. Each woman gave a strong performance, they bounced off each other and there were some extraordinary moments between the women, demonstrating that life in the munitions factory was more than patriotism and yellow hands; there is sisterly love, conflict and family secrets. I urge you all to go see Swan Canaries, you will laugh, sing, cry and admire the heroic women who worked in Shell – filling Factory Number 6, Chilwell, Nottinghamshire. A thought provoking look in to women’s roles in the First World War. 2014 marks a century since the beginning of The Great War. This, we can presume, is one of the reasons why Arletty Theatre, a troupe funded by the Arts Council England, decided to bring some of our local war heroes to life on the stage. For those of you that don’t know, Chilwell Canaries was the name for a group of amazing women who, in the First World War, filled bombs in a factory in Chilwell. The Canary Girls were so named due to working with explosives, which stained their skin yellow. Up to 19 million bombs were filled in the factory up until the 1 July 1918, when the factory exploded, killing many of the workers. Amazingly, those that survived the explosion returned to work the next day. Swan Canaries focuses on four women working at the factory in the lead up to the explosion, Rose, Mary, Polly and Violet. Polly is a young girl working in the factory whose fiance has been called to the front line. She is shown the ropes by his mother, Rose, who bears a secret about the boy. As tempers rise and lives are threatened the secret becomes more of a burden to those involved. The sets were very bare and the actors relied on movement and song to bring the story to life, which gave the performance a homespun and engaging feel, reminiscent of the ‘make do’ attitude of the war. One of the best parts of the play was the community vibe that was brought to the church hall in which we watched the drama unfold to life. At half time there was a sing-a-long of old war songs, including It’s A Long Way To Tipperary and Pack All Your Troubles (In Your Old Kit Bag). The audience were even provided with a song sheet and everyone, whether they knew the song or not, joined in. It definitely kept the audience on their toes and the older members of the audience looked delighted to have a good ole knees up. At turns funny, thought-provoking and harrowing, Swan Canaries masterfully examines the camaraderie between women from a small village working together for the good of the country. The play will be touring for a long while yet, so we recommend that you grab your nanna and take her out for an evening that neither of you will forget for a long while.